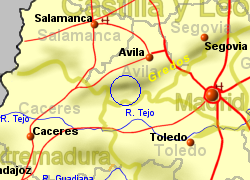 The Sierra de Gredos mountains, located close to the southern border of Castilla y Leon, start around 80Km due west of Madrid and run westward for another 100Km into the region of Extremadura, almost reaching Plasencia. 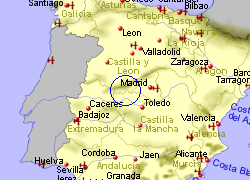 This mountain continues the line of the Sierra de Guadarrama, which run for over 100km across the northwest approaches of Madrid. The mountain range has peaks rising to just over 2,500m and will have a covering of snow for much of the winter. 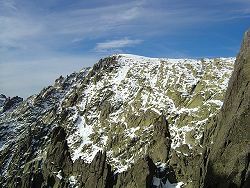 The centre of the range, the Cirque de Gredos which includes the highest peak (Pico de Almanzor 2,593m) is particularly spectacular, having been shaped by glaciers, a north facing arc of mountain peaks surrounding a lagoon. This scene is visible looking across the Tormes valley from the first ever Parador (state run luxury hotel) whose position was personally chosen by King Alfonso XIII in 1928, about 15Km to the northeast. This is serious walking and climbing country though can be cold and bleak away from mid summer. The whole area is dotted with beauty spots and walking opportunities and available activities include mountain biking, alpine skiing, cross country skiing, canoeing, river rafting, climbing, assailing, bird watching, and horse riding. The northern side of the Sierra de Gredos is the most rugged with fast flowing streams flowing through small villages inhabited by farmers. The southern side is softer and warmer with larger villages amongst orchards, vineyards and other vegetable growing. Wildlife in the area includes mountain goats (the emblem of the Gredos and protected), black and griffin vultures, golden and imperial eagles. 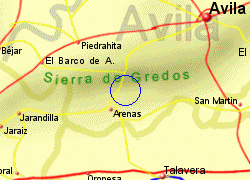 Map of the Gredos Mountains area.